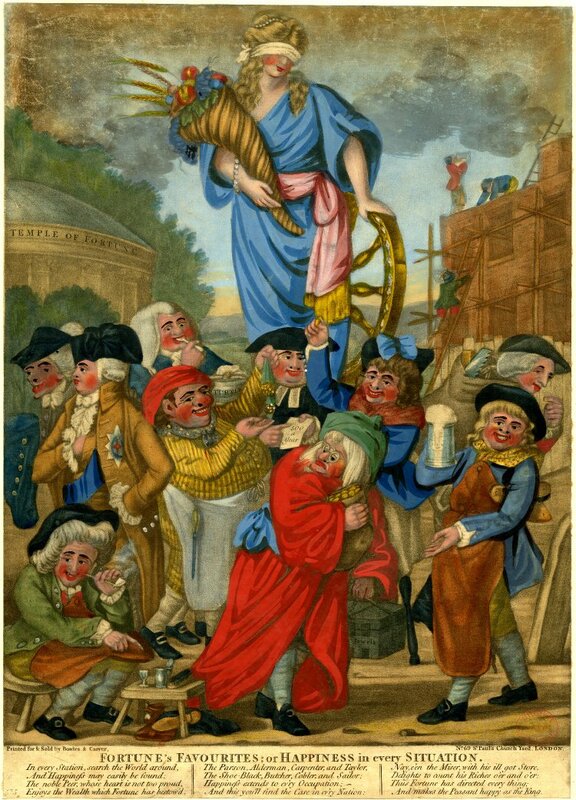 Fortune's Favourites: or Happiness in every Situation, Robert Dighton, printed by Bowles & Carver, 1786, British Museum. The image is crowded, so the sailor is obscured by the miser. Over his loose and flowing locks, our tar wears a cocked hat with the point forward and a large blue cockade on the left side. Around his neck is a red neckcloth, draped over his shirt and jacket. The blue jackets is fitted with open mariner's cuffs with white or silver buttons. Beneath his plain petticoat trousers is a wooden leg.